Background: Despite the availability of new potent medical therapies, the rate of progression of angiographic coronary artery disease (CAD) is not well described. The aim of this analysis is to describe the rate and predictors of progression of CAD among patients with recurrent symptoms. Materials and Methods: We reviewed 259 patients (mean age 61 ± 11 years, 70% males) who underwent two coronary angiograms between 2008 and 2013. Progressive CAD was defined as obstructive CAD in a previously disease-free segment or new obstruction in a previously nonobstructive segment. Patients who had coronary artery bypass surgery between these two angiograms were excluded from the analysis. Multivariate logistic regression was used to determine the independent predictors of progression of CAD. Results: The included cohort had a high prevalence of coronary risk factors; hypertension (71%), diabetes (69%), and dyslipidemia (75%). 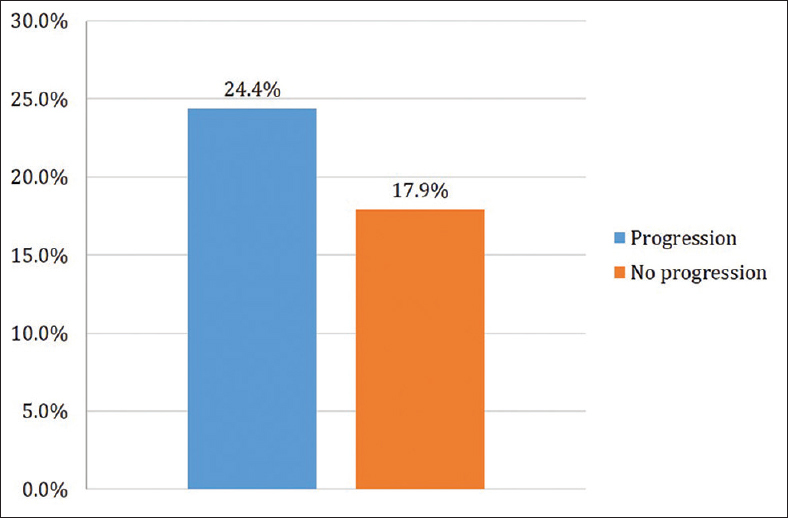 Despite adequate medical therapy, more than half of the patients (61%) had CAD progression. Using multivariate logistic regression, a drop in the left ventricular ejection fraction (LVEF) by more than 5% was the predictor of CAD progression (adjusted odds ratio 5.8, P = 0.042, 95% confidence interval 1.1–31.2). Conclusion: Among high-risk patients with recurrent symptoms, the short-term rate of progression of CAD is high. A drop in LVEF >5% is a predictor of CAD progression. Further studies are needed to determine the prognostic value of CAD progression in the era of potent medical therapy. In univariate analysis, male patients, history of prior myocardial infarction, and patients with systolic heart failure have a higher prevalence of progressive CAD (75%, 20%, and 18% vs. 61%, 11%, and 4%, respectively). Most of study cohort had a control risk factors, (60%) had low-density lipoprotein (LDL) <100 mg/dl, (65%) had triglyceride <150 mg/dl, and (80%) had cholesterol <200 mg/dl [Table 1]. In a multivariate logistic regression, a drop in the left ventricular ejection fraction (LVEF) >5% was a predictor of CAD progression (adjusted odds ratio 5.8, 95% confidence interval 1.1–31.2, P = 0.042) [Figure 1]. Mintz GS, Painter JA, Pichard AD, Kent KM, Satler LF, Popma JJ, et al. Atherosclerosis in angiographically “normal” coronary artery reference segments: An intravascular ultrasound study with clinical correlations. J Am Coll Cardiol 1995;25:1479-85. Libby P, Ridker PM, Hansson GK; Leducq Transatlantic Network on Atherothrombosis. Inflammation in atherosclerosis: From pathophysiology to practice. J Am Coll Cardiol 2009;54:2129-38. McCready RA, Vincent AE, Schwartz RW, Hyde GL, Mattingly SS, Griffen WO Jr. Atherosclerosis in the young: A virulent disease. Surgery 1984;96:863-9. Chan W, Stub D, Clark DJ, Ajani AE, Andrianopoulos N, Brennan AL, et al. Usefulness of transient and persistent no reflow to predict adverse clinical outcomes following percutaneous coronary intervention. Am J Cardiol 2012;109:478-85. Kimbiris D, Iskandrian A, Saras H, Goel I, Bemis CE, Segal BL, et al. Rapid progression of coronary stenosis in patients with unstable angina pectoris selected for coronary angioplasty. Cathet Cardiovasc Diagn 1984;10:101-14. Rafflenbeul W, Nellessen U, Galvao P, Kreft M, Peters S, Lichtlen P. Progression and regression of coronary sclerosis in the angiographic image. Z Kardiol 1984;73 Suppl 2:33-40. Ben-Zvi J, Hildner FJ, Javier RP, Fester A, Samet P. Progression of coronary artery disease. Cinearteriographic and clinical observations in medically and surgically treated patients. Am J Cardiol 1974;34:295-301. Houslay ES, Cowell SJ, Prescott RJ, Reid J, Burton J, Northridge DB, et al. Progressive coronary calcification despite intensive lipid-lowering treatment: A randomised controlled trial. Heart 2006;92:1207-12. Sipahi I, Tuzcu EM, Schoenhagen P, Wolski KE, Nicholls SJ, Balog C, et al. 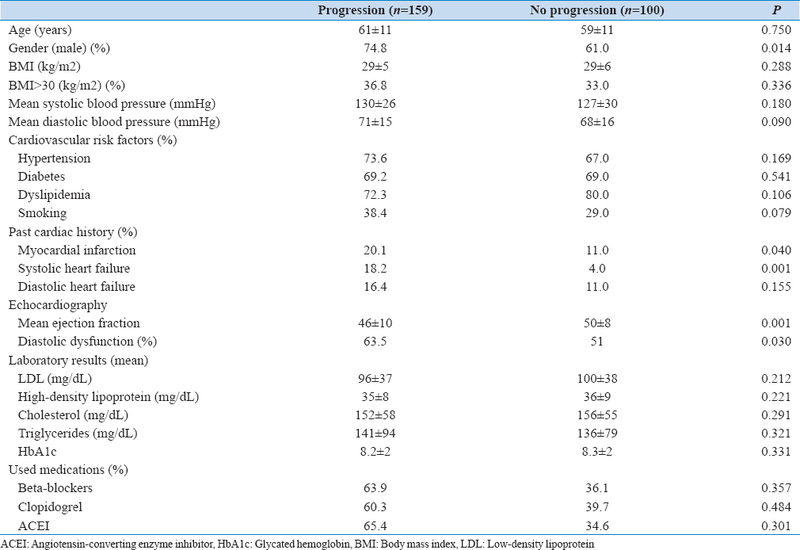 Effects of normal, pre-hypertensive, and hypertensive blood pressure levels on progression of coronary atherosclerosis. J Am Coll Cardiol 2006;48:833-8. Kataoka Y, Wolski K, Balog C, Uno K, Puri R, Tuzcu EM, et al. Progression of coronary atherosclerosis in stable patients with ultrasonic features of high-risk plaques. Eur Heart J Cardiovasc Imaging 2014;15:1035-41. Trianti M, Xanthos T, Iacovidou N, Dagres N, Lekakis JP, Kyriakou F, et al. Relationship between individual cardiovascular risk factors and localization of coronary atherosclerotic lesions. Heart Lung 2011;40:201-7. Bunch TJ, May HT, Bair TL, Crandall BG, Weiss JP, Osborn JS, et al. Trends in early and late mortality in patients undergoing coronary catheterization for myocardial infarction: Implications on observation periods and risk factors to determine ICD candidacy. Heart Rhythm 2011;8:1460-6. Cerqueira MD, Weissman NJ, Dilsizian V, Jacobs AK, Kaul S, Laskey WK, et al. Standardized myocardial segmentation and nomenclature for tomographic imaging of the heart. A statement for healthcare professionals from the Cardiac Imaging Committee of the Council on Clinical Cardiology of the American Heart Association. Circulation 2002;105:539-42. Schoenenberger AW, Jamshidi P, Kobza R, Zuber M, Stuck AE, Pfisterer M, et al. Progression of coronary artery disease during long-term follow-up of the Swiss Interventional Study on Silent Ischemia Type II (SWISSI II). Clin Cardiol 2010;33:289-95. Haft JI, Bachik M. Progression of coronary artery disease in patients with chest pain and normal or intraluminal disease on arteriography. Am Heart J 1984;107:35-9. Moise A, Théroux P, Taeymans Y, Waters DD. Factors associated with progression of coronary artery disease in patients with normal or minimally narrowed coronary arteries. Am J Cardiol 1985;56:30-4. Nissen SE, Nicholls SJ, Sipahi I, Libby P, Raichlen JS, Ballantyne CM, et al. Effect of very high-intensity statin therapy on regression of coronary atherosclerosis: The ASTEROID trial. JAMA 2006;295:1556-65. Chhatriwalla AK, Nicholls SJ, Wang TH, Wolski K, Sipahi I, Crowe T, et al. Low levels of low-density lipoprotein cholesterol and blood pressure and progression of coronary atherosclerosis. J Am Coll Cardiol 2009;53:1110-5. Bayturan O, Kapadia S, Nicholls SJ, Tuzcu EM, Shao M, Uno K, et al. Clinical predictors of plaque progression despite very low levels of low-density lipoprotein cholesterol. J Am Coll Cardiol 2010;55:2736-42.